Celebrate spring Bulgarian-style with a dance party, featuring live music by Nomadi, Orkestar Bez Ime (OBI), and Traki, with special guests Mila Vocal Ensemble. Kid-friendly until 10:00pm. Martenitsa is a musical celebration of the coming of spring and the holiday of Baba Marta (baba meaning "grandma," and Marta a derivative of the word for "March"). Traditional folklore depicts Baba Marta as a temperamental old woman whose moods are as changeable as March weather. On March 1st, it is customary to exchange and wear Martenitsi—tokens of good health, luck and vitality. Wearing the red and white yarns of the Martenitsa symbolizes the hope that Baba Marta will smile and grant us an early spring. After this snowy February, the end of winter cannot come soon enough! Available directly through Amsterdam's ticket outlets or online through Eventbrite. NEWPOLI stirs up a mesmerizing sound that melds traditional Italian folk music, Greek and Turkish Grooves, Mediterranean and Spanish colors. With the pulsing of the tamburello and the wild, frenetic dancing of the two female lead singers, their performance at The Cedar is sure to make audience members eager to get on their feet. This is an all-ages, seated show. Doors open at 7:00pm; show starts at 7:30pm. Presented by The Cedar, KFAI and Drone Not Drones, this is an all-ages, 28-hour concert that celebrates the expansive world of drone music while raising funds for Doctors Without Borders. Musicians from across the musical spectrum will unite to create a continuous, uninterrupted, 28-hour drone of unified sound. Be part of a unique experience while supporting a just cause. Come by before work, after work, or both. This is a standing show with an open floor. Bring a pillow/blanket to make yourself comfortable! For more details, an up-to-date schedule, and to buy tickets, see The Cedar's event listing. Every social movement in modern history has been inspired by music that rouses the masses, speaks truth to power, and cements public consciousness. On MLK weekend 2019, join VocalEssence and guest artists (Mila Vocal Ensemble among them) to raise your voice and give back. In partnership with the Minnesota Historical Society, sing songs of protest and progress, move your feet to the rhythm of justice, try your hand at spoken word performance, and volunteer for a cause. All ages welcome. Admission to the 1968 and Somali American Exhibits may be purchased separately through the Minnesota Historical Society. Mila is proud to present Mosaic, a touring show featuring stories of life and love, told through centuries-old songs. With authentic folk styling in the native languages of Bulgaria, Georgia, Ukraine, Croatia, Russia and Romania, this music delights, moves, and haunts us. The tour kicked off this summer at the Driftless Music Festival in Viroqua, Wisconsin, and continues in Minnesota this fall and winter. We're very excited to be performing at Driftless Music Festival, on July 14th! There will be great music all day, starting at 1:00pm, at Eckhart Park in beautiful Viroqua, WI. Eckhart Park is located on Decker St. (Highway 56) between Dunlap and Western Avenues. Mila will be closing the festival from 8:30pm - 10:00pm. Hope to see you there! Celebrate spring Bulgarian-style with a dance party, featuring live music on two stages by Mila Vocal Ensemble, Nomadi, Orkestar Bez Ime (OBI), and Traki, co-hosted by the Bulgarian School of Minnesota. New this year: make your own martenitsi! Kid-friendly until 10:00pm. Martenitsa is a musical celebration of the coming of spring and the holiday of Baba Marta (baba meaning "grandma," and Marta a derivative of the word for "March"). Traditional folklore depicts Baba Marta as a temperamental old woman whose moods are as changeable as March weather. On March 1st, it is customary to exchange and wear Martenitsi—tokens of good health, luck and vitality. Wearing the red and white yarns of the Martenitsa symbolizes the hope that Baba Marta will smile and grant us an early spring. As we Minnesotans know, the end of winter can never come soon enough. Available directly through Amsterdam's ticket outlets or online through Ticketfly. Join us for an evening of songs from Eastern Europe. A reception with light refreshments will follow the show. Admission: $12 adults / $10 seniors, students, kids 12 and under. 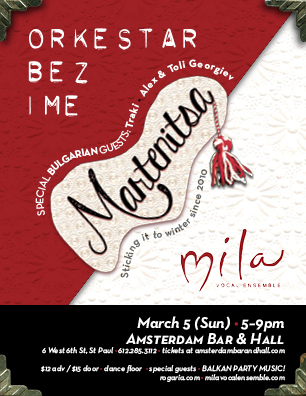 Orkestar Bez Ime (OBI) and Mila Vocal Ensemble proudly present Martenitsa, an annual Balkan celebration of spring—now at the Amsterdam Bar and Hall in St. Paul. What started as a small underground gathering of Balkan music-obsessed fans and the local Bulgarian community has grown into a massive Balkan dance party featuring music from Bulgaria, Macedonia, and surrounding areas. This year, they bring back a special group of Bulgarian guests to the party: the Twin Cities-based folk ensemble Traki, which upholds the traditional Bulgarian folk idiom while also adapting to the ever-evolving Bulgarian folk music scene. The group is a longtime collaborator with both OBI and Mila, and, in fact, helped initiate one of the first official Twin Cities Martenitsa celebrations a decade ago. With this amount of musical fireworks, audience members can count on a festive and memorable Martenitsa to light up the Amsterdam! OBI and Mila's musical celebration of the coming of spring—traditionally referred to as the ancient Bulgarian holiday of Baba Marta (baba meaning "grandma," and Marta a derivative of the word for "March")—is highly anticipated every year, not only for the music and camaraderie, but also for the symbolic parallel many Minnesotans feel during a long winter: Traditional folklore depicts Baba Marta as a temperamental old woman whose moods are as changeable as March weather. On March 1st, it is customary to exchange and wear Martenitsi—tokens of good health, luck and vitality. Wearing the red and white yarns of the Martenitsa symbolizes the hope that Baba Marta will smile and grant us an early spring. As we Minnesotans know, the end of winter can never come soon enough. Whether known as steppes, prairies, savannahs, or pampas, the grasslands of the world cover 25% of the earth's surface. They are present wherever rainfall is insufficient to produce a forest but enough to prevent the formation of a desert. In their fall concert series, Grasslands, Ethnic Dance Theatre and the EDT Orchestra, along with guest artists Mila Vocal Ensemble, take you on a journey through the temperate grasslands of Croatia, Argentina, Poland, Romania, Ireland, Ukraine, Russia, Mexico, Mongolia, and Bulgaria. The program will feature works such as Posavska Žetva, depicting a harvest scene from the Croatian region of Posavina, a suite of dances from the plains of Thrace, and additional choreographies such as Bailes Norteños from Chihuahua, Mexico, El Cuando from Argentina, and Myangad from Mongolia. Purchase tickets online, by phone, or at the E.M. Pearson box office up to one hour prior to each show. If you missed the December 4th world premiere of Natalie Nowytski's "Perekotypole," with Mila Vocal Ensemble, we will be reprising the program on Saturday, December 12th, at Unity Church - Unitarian. For more information about this very special encore performance of Nowytski's thirteen new Ukrainian choral works, set to Nadia Lan's poetry, find this event on Facebook. Natalie Nowytski is a fiscal year 2015 recipient of an Artist Initiative grant from the Minnesota State Arts Board. This activity is funded, in part, by the Minnesota State Legislature from the State's arts and cultural heritage fund with money from the vote of the people of Minnesota on November 4, 2008. This is a donation-based event. Please join us! Please join Natalie Nowytski and Mila Vocal Ensemble for a very special night, featuring Natalie's thirteen new Ukrainian choral works, set to Nadia Lan's poetry. About the poetry: In 1978, Nadia Lan compiled decades' worth of her poetry in a collection called "Perekotypole" (Tumbleweed—a metaphor for the Ukrainian culture, especially those who have emigrated). Nadia Lan's poems range from the early 1920s when she was a young woman in Ukraine living under the oppression of a newly established Soviet empire, to her post-WWII years living in a German refugee camp, to her transition as a "New American" in the 1970s. Thoughtful, funny, heartbreaking, compassionate, stern—her poetry is the embodiment of many people's experiences, not only of her lifetime, but also of today. 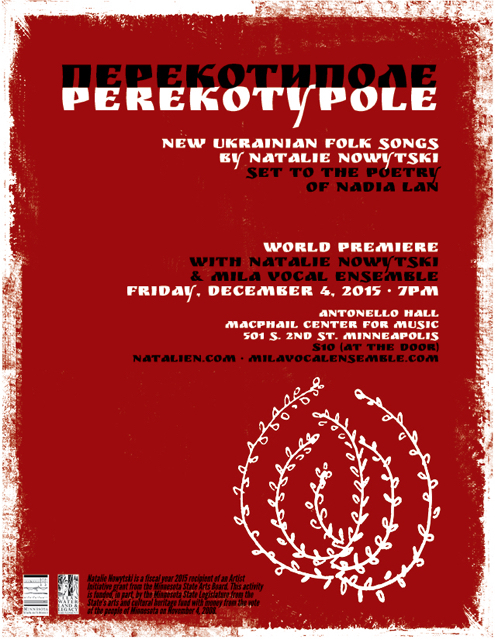 About the music: Natalie's song project—also entitled "Perekotypole"—pulls from multiple traditions that have inspired her both as a singer and as a composer: Her interpretation of Lan's poems range from traditional Ukrainian to Balkan to Central Asian, even extending to American bluegrass, including perhaps the first ever Ukrainian-Appalachian gospel song. Tickets ($10) can be purchased at the door or from one of the performers. For more information, find this event on Facebook. Mila is honored and delighted to open for Zedashe Ensemble at The Cedar Cultural Center. Zedashe Ensemble is based in the medieval fortress city of Sighnaghi, Eastern Georgia, which has been home to the Kiziqian wine growers and warriors since ancient times. Directed by Ketevan Mindorashvili, the current incarnation of the ensemble was founded in the mid 1990s to sing repertoire largely lost during the Communist era. Their repertoire consists of ancient three-part harmony chants from the Orthodox Christian liturgy, folk songs from the Kiziqian region as collected from village song-masters and old publications, and folk dances from the region. See event page on The Cedar's website for more information and to buy tickets online. Zenon Dance Company, one of the nation's premier repertory dance companies, and Mila Vocal Ensemble present the world premiere of Wynn Fricke's The Mourning Tree, set to a palette of colorful Bulgarian folk melodies. These songs, which startle with their arresting rhythms and harmonies, tell age-old stories of love and sorrow. The choreography captures their themes in a powerfully ritualistic and contemporary expression. For this series, Mila Vocal Ensemble is joined by guest artist Natalie Nowytski. Zenon's 32nd Spring Season will also feature a world premiere by post-modern wunderkind Chris Schlichting. Be moved by Cuban choreographer Osnel Delgado's "Coming Home," in which baseball and movement are common ground, and through other contemporary works of spectacular, daredevil, gorgeously arresting performance by the Twin Cities' most accomplished dancers. Mila Vocal Ensemble illuminates the folk traditions of Eastern Europe with an evening of music and explanation. From the incandescence of Bulgarian music to the sparkle of Ukrainian melodies to the soft glow of Georgian harmonies, the same night sky has inspired songs passed down through generations. This free concert is part of the University of St. Thomas Sacred Arts Festival. Parking: Everyone attending this concert may park anywhere on campus, including lot P.
Martenitsa - Celebrate spring, Balkan style! Dance, sing, eat, drink and be merry with Orkestar Bez Ime and Mila Vocal Ensemble, on this ancient Bulgarian holiday of Baba Marta. This year, our annual celebration has a new home: Lowertown's beloved Bedlam Theatre. What started as a small underground gathering of Balkan music-obsessed fans and the local Bulgarian community has grown into a massive Balkan dance party featuring music from Bulgaria, Macedonia, and surrounding areas. Tickets are $5 at the door or in advance (651-209-0597). Join Mila Vocal Ensemble and Ethnic Dance Theatre for a seasonal showcase of song and dance from Bulgaria, Croatia, Georgia, Germany, Hungary, Norway, Serbia, and Ukraine. Featuring traditions from St. Nicholas day, the Christmas season and the New Year, this musical extravaganza will delight young and old alike! Celebrating their 40th Anniversary Season, the artists of Ethnic Dance Theatre will present choreographies from each decade of the company's repertoire, representing the artistic vision of co-founder and Artistic Director, Donald La Course. The company of dancers will collaborate with the EDT Orchestra, many members of which are McKnight Foundation and American Composers Forum award winners. Master vocalist Natalie Nowytski and Mila Vocal Ensemble will also share the stage. Ethnic Dance Theatre is known for its exquisite costume collection, consisting of over 5,000 pieces representing 55 distinct cultures from around the world. In addition to complementing the choreographies, selected examples of EDT's collection will be modeled in the lobby during intermission. Following the Friday, June 27 performance, join the artists of Ethnic Dance Theatre for a discussion as part of The Cowles Center's Meet the Company: Talk-Back Series. This question and answer session is an ideal opportunity for audiences to meet artistic staff and company members, ask questions, and enrich their live performance experience. Prior to the Sunday, June 29 matinee, there will be a Family Day package that includes a Trip Around the World dance workshop, hosted by EDT alumnus and teacher Christopher Yaeger, as well as a special meet and greet session. Family Day starts at 12:45pm; show at 2:00pm. Please call the box office at 612.206.3600 to reserve this package. Purchase tickets online or by phone. Mila Vocal Ensemble will be appearing as part of the Minneapolis Institute of Arts' Third Thursday event, singing in the MAEP Galleries near work from Minnesota artist Jonathan Bruce Williams. The Minnesota Artists Exhibition Program (MAEP) is a curatorial department of the Minneapolis Institute of Arts (MIA) dedicated to exhibiting and supporting artists living and working in the state of Minnesota. Begun in 1975 as a creative partnership with the MIA, the MAEP was founded by a group of regional artists interested in creating an innovative exhibition and programming space. What began as a year-long agreement has been extended into an ongoing relationship between the Minnesota artist community and the MIA. For more information on this FREE event, please visit this page. Proceeds to support the humanitarian needs of the Maidan protestors in Ukraine. Sponsored by: Maidan Minnesota Committee. Open to ALL. Voluntary Donations. Cash Bar / Ukrainian Foods available throughout the evening. Mila Vocal Ensemble is looking forward to sharing our unique sound at Winter Bluegrass Weekend: A Festival of Bluegrass & Old-Time Music & Dance. The festival takes place Friday-Sunday, February 28 through March 2, 2014. Mila will be featured at the "Spotlight On: Singing" event at the festival. "Spotlight On" is an annual concert held Saturday evening in the Music & Dance Hall (lower level) from 5:30pm to 7:30pm and hosted by Phil Nusbaum. Each year, it features a different slice of local music that is not necessarily bluegrass. This year's theme is vocal group music and features Mila Vocal Ensemble, singers of sea chanteys and related sea songs The Eddys, and the local Sacred Harp singing group. Tickets available in advance or at the door. Single-day and weekend passes available. Welcome the coming of Spring, with Orkestar Bez Ime and Mila Vocal Ensemble, on the eve of Baba Marta, an ancient Bulgarian holiday. ("Baba" means "Grandma" in Bulgarian, and "Marta" comes from the word "mart," or "March.") Traditional folklore depicts Baba Marta as a temperamental old woman whose moods are as changeable as March weather. On March 1st, it is customary to exchange and wear Martenitsi - tokens of good health, luck and vitality. Wearing the red and white colors of the Martenitsa symbolizes our hope that Baba Marta will smile and grant us an early Spring! We couldn't resist celebrating early this year - over happy hour and dinner on February 28th. Please join us for this lively evening of music from Bulgaria, Macedonia and surrounding areas. This concert features award-winning vocalist Natalie Nowytski with friends, including Bulgarian gadulka player Nikolay Gueorguiev, womens a cappella group Mila Vocal Ensemble, Balkan party band Orkestar Bez Ime, and the folk supergroup Ukrainian Village Band. The groups will share a selection of music that covers the Balkans to the Carpathians, including Bulgaria, Bosnia, Croatia, Latvia, Macedonia, Romania, Russia, Serbia, Ukraine, as well as music of the Roma, the Carpatho-Rusyns, and others. The audience might even see the musicians intermingling and collaborating on songs throughout the program, as nearly everyone on the stage has worked with one another at some point. At 7:00pm the artists will give a talk on what to listen for in Eastern European music to help those new to the music, followed by the concert itself at 7:30pm. 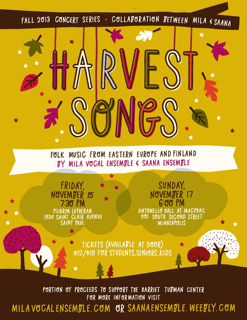 7:00pm pre-concert talk, "Listening to Eastern European Music"
Join Mila and Saana Ensemble for an evening of songs celebrating the joys of harvest time. Delight in musical sounds and styles from Finland, Latvia, Russia, Ukraine, Bulgaria and Croatia. Relax into the spirit of bounty, gratitude and collaboration that infuses this concert program. A portion of the proceeds from these concerts will be donated to Tubman family crisis and support services. Orkestar Bez Ime hosts Mila at their "3rd Thursdays at Black Dog" event. Stop by the Black Dog for Balkan party music and good fun. This is a free, family-friendly show. Mila joins Orkestar Bez Ime for a summer evening of music and festivities at the Black Dog in St. Paul. Join us for a free, family-friendly show! Explore musical treasures of the Black Sea and surrounding areas, in a sight- and sound-spectacular presentation by Ethnic Dance Theatre (EDT). This concert will incorporate traditional choreography, live music and award-winning costumes. ASL interpretation will be a part of each performance. Artistic Director Donald La Course and John Omorean from the Twin Cities' Izvorasul Romanian Dance Ensemble created choreography for "Black Sea Treasures," including five new premieres and four revivals from the EDT repertoire. Dances from Georgia, Russia, Ukraine, Romania, Bulgaria and Turkey will be featured. The acclaimed EDT Folk Orchestra will perform all the musical sets, and guest artists Mila Vocal Ensemble will provide vocal music from Russia, Ukraine and Bulgaria. Purchase tickets online or by phone. Tickets also available at the door, starting two hours before showtime. Orkestar Bez Ime and Mila Vocal Ensemble present a musical celebration of the coming of Spring, on this ancient Bulgarian holiday of Baba Marta. ("Baba" means "Grandma" in Bulgarian, and "Marta" comes from the word "mart," or "March.") Traditional folklore depicts Baba Marta as a temperamental old woman whose moods are as changeable as March weather. On March 1st, it is customary to exchange and wear Martenitsi - tokens of good health, luck and vitality. Wearing the red and white colors of the Martenitsa symbolizes our hope that Baba Marta will smile and grant us an early Spring. Special guests SlovCzech will keep revelers dancing into the wee hours, with their signature blend of Contemporary Czechoslovak and European Folkrock styles. Join us for this musical celebration of Spring. Chestita Baba Marta! Inspired by the ancient, Romanian tradition of colindători (Christmas carolers), Mila Vocal Ensemble presents a holiday concert that will take audiences on a breathtaking tour of Eastern European holiday sounds. Music lovers will be thrilled by the bracing sounds of Croatia, surprised by the raw energy and dissonant harmonies of Bulgaria, and charmed by joyful Ukrainian carols. Treats from Romania, Russia, Belarus, Georgia and Serbia also will delight new audiences and familiar friends alike. In the spirit of the caroler, Mila will take their Friday show on the road to Crossings Art Center, a folk musicians' favorite in Zumbrota, MN. Enjoy the ambiance and crisp acoustics in a cozy, smaller-town setting. Saturday's concertgoers will appreciate the local appeal of the Croatian Hall in South St. Paul, with its stunning woodwork and low-key charm. Stay, mingle with friends, and raise a glass at the post-concert holiday party! Refreshments and a cash bar will be provided. Sunday's matinee offers a warm dose of holiday spirit in the airy, greenery-infused sanctuary at Unity Church in St. Paul. Take a journey from the Black Forest to the Black Sea as Ethnic Dance Theatre (EDT) presents Reflections on the Danube. EDT is known for traditional presentations of the movements, sounds and colors of various ethnic dance and music cultures. This performance will reflect EDT's signature style, incorporating traditional choreography, live music and spectacular costumes. Artistic Director Donald LaCourse, EDT resident choreographer Eva Maria Kish, and guest choreographers John Morovich from Seattle and John Omorean from the Twin Cities will premier three new choreographies: LaCourse will stage Tanze vom Schwarzwald, from the fairytale-like Black Forest of Germany. Morovich will create a new work from the Baranja region of Croatia featuring enchanting music and priceless antique costumes. Omorean's piece comes from the Danube delta region of Dobrogea in Romania, with haunting violins and lightning footwork. In addition, several works from the EDT repertoire will be revived, representing music and dance from Bulgaria, Austria, Slovakia, Serbia and Hungary. McKnight-award-winners Orkestar Bez Ime will perform all musical sets. This show also will feature the vocal talents of singer Natalie Nowytski and Mila Vocal Ensemble. ASL interpretation will be a part of each performance. Orkestar Bez Ime and Mila Vocal Ensemble present a musical celebration of the coming of Spring, on this ancient Bulgarian holiday of Baba Marta. ("Baba" means "Grandma" in Bulgarian, and "Marta" comes from the word "mart," or "March.") Traditional folklore depicts Baba Marta as a temperamental old woman whose moods are as changeable as March weather. On March 1st, it is customary to exchange and wear Martenitsi - tokens of good health, luck and vitality. Wearing the red and white colors of the Martenitsa symbolizes our hope that Baba Marta will smile and grant us an early Spring! Join us for this lively evening of music from Bulgaria, Macedonia and surrounding areas. Mila Vocal Ensemble and McKnight Artist Fellowship-winner Orkestar Bez Ime perform together - outside and unplugged - at Walker Art Center's Acoustic Campfire. Part of the Walker Open Field series, this relaxed summertime event promises to captivate. Dancing encouraged! Join Orkestar Bez Ime and Mila Vocal Ensemble for an energetic evening of music from Bulgaria, Macedonia, and surrounding areas. "Martenitsa" is a Bulgarian tradition welcoming spring, which we'll all be looking forward to after the winter we've had. Bring a friend or come alone. Dance, listen, carouse. Na zdrave! 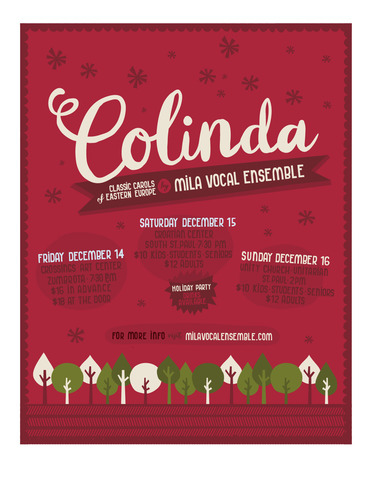 Join Mila Vocal Ensemble for a delightful evening of traditional holiday music. We will perform musical selections from a variety of Eastern European countries. Tickets for these shows will be available at the door; $10 for adults and $5 for seniors, students, or youth. Join Mila Vocal Ensemble for a melodic evening traversing from the steppes of Russia to the mountain tops of Bulgaria! Tickets for this show will be available at the door; $12 for adults and $5 for seniors, students, or youth. Ivan loves Tudora. Todora loves Kolyo. And Kolyo loves....who? Find out at First Love: A Bulgarian Tale." Featuring vibrant music and dance from exotic Bulgaria! 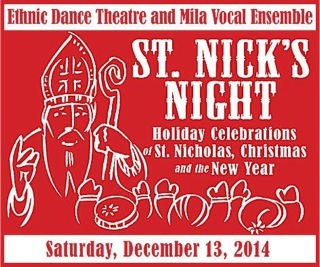 Presented by the Ethnic Dance Theatre with live music by the EDT Folk Orchestra and guests, Mila Vocal Ensemble. Nourish the mothers in your life with a delectable assortment of songs and stories from Eastern and Central Europe. With thrilling harmonies and captivating spoken word, Mila will follow the mother's journey from girlhood to grandmotherhood and honor her many contributions as wife, mother, cook and tradition keeper. Spicy accompaniment by the Niks Folk Ensemble. If you missed our first series of podcasts in the days leading up to the V Gradinata CD release party, you can still hear the episodes by visiting www.milavocalensemble.com/milacast. Let us know what you think by e-mailing milacast@milavocalensemble.com.